At sea all day and tomorrow. Sat beside stern terrace pool – reading and listening to audio book – then finally yes finally got the trunks wet. The pool did not need to produce waves as the motion of the ship created its own. The bridge made its usual announcements at 8 bells (midday) and informs us it is expected to reach 82 * when we arrive in Cadiz on May 9. Lazy day at sea reading and listening to audio books. Took in lecture on Apollo 13 moon mission with audio of how the disaster unfolded and the efforts successfully of the team to get the astronauts home. A pod of dolphins swam by as I was reading on deck 7. The coast line of Spain is now in view as we make our way to Cadiz. Arrive 9am. Disembarked around 11 for a walk around this beautiful Spanish town. Maps available on board decided to follow the purple route which was one of four with interesting places along the way. Very warm had our morning refreshment at the cathedral. Returned to ship after lunch time. 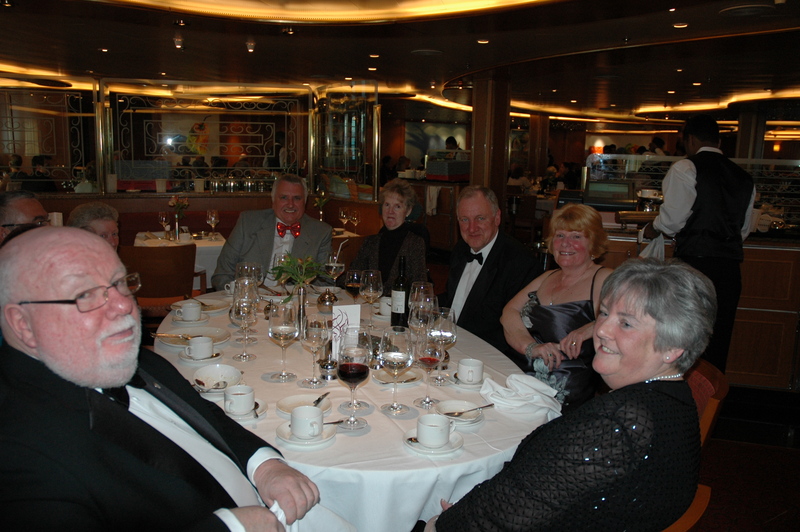 Of course it was the old fella’s birthday so had booked dinner in The White Room restaurant, located deck 17 Aft. Starter was king prawns, main course Margaret had spaghetti with lobster and yours truly had medallion of beef; sweet was poached peaches in mousse of some kind and tiramisu for me. Wine was a dry rosé. 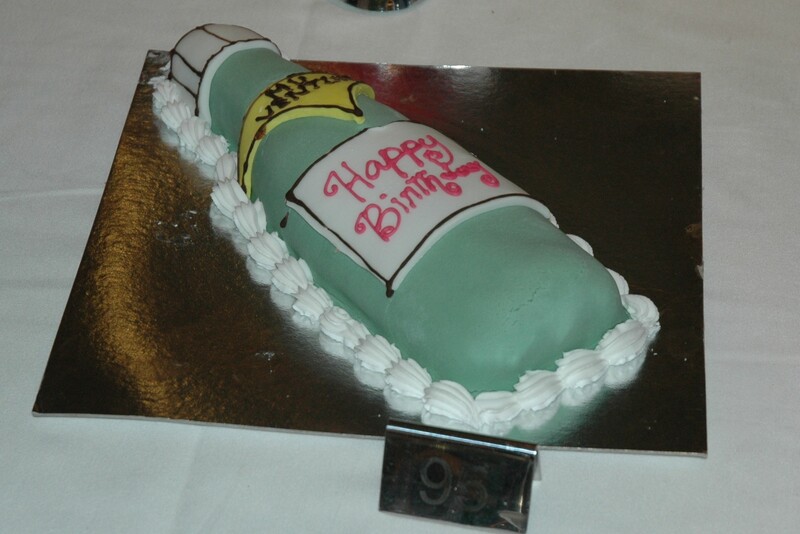 My birthday cake was in shape of a bottle which I kept for the next evening. A very nice way to celebrate my birthday with cards I had brought from home. A special thanks to all those who posted on Facebook – messages which I have just seen. Another very warm day with temp expected to reach 32*. Set off on the shuttle bus to the main square and spent a good while just roaming the streets looking at the antiquities. Again a very clean and vibrant city returned to ship around 2pm as there is always large queues to get the shuttle buses. The last sail away got into full swing at 5-30 our departure to the UK. Many union jack flags distributed all great fun to end the cruise. Evening meal we had my cake from the night before to share with our Ventura sailing buddies and of course the waiters sang happy birthday to the embarrassed you know who, LOL. So that is the feature part of the cruise over just make our way up the coast of, Portugal, Spain and France to the UK. Awake this morning to very misty conditions and 11 feet waves. We have a distance of 662.4 nautical miles to go as of 07:30am. One should pick out a highlight and would not be a surprise for me to say Venice. I was up early for the arrival with the sun just breaking through seeing the city deserted from on board. Traveling into St Marks square by water bus with the local population – how the boats, gondolas do not collide more often is a wonder. The sail away along the main seaway was nothing short of breath-taking to see the city from deck 16 and able to look across the city it was like you were afforded your own panoramic place to view the sites. 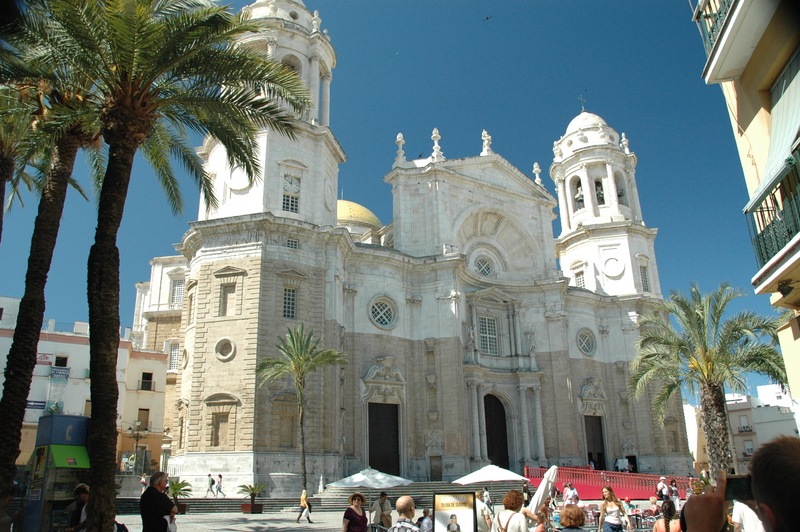 Cadiz was a lovely city also right next to the ships berth. 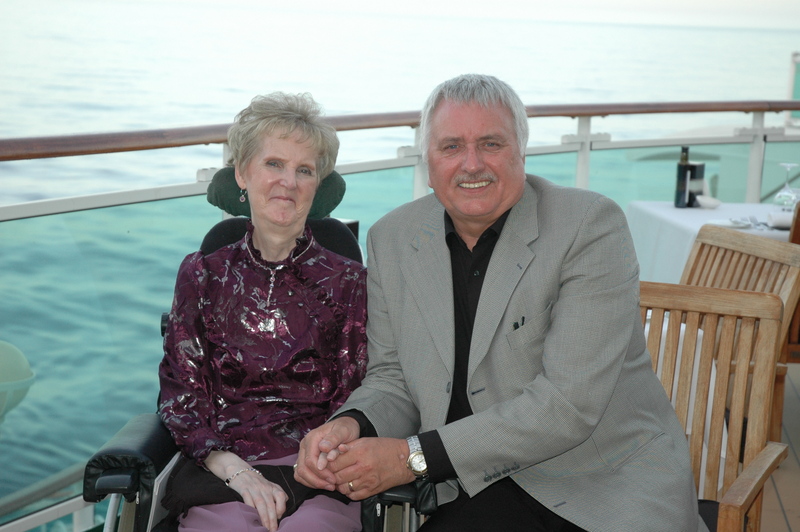 Margaret and I have now covered most of the Mediterranean cities that one wishes to get to, we have not exhausted the places as the wheelchair access sometimes is very difficult but we have not been beaten yet when we have managed to get off ship. Till the next cruise, holiday whatever. Up early around 06:45 sun steaming in cabin window (18* C) did 30 mins o n deck 7 which is the keep fit deck with track laid out for a distance of 1 mile = 4 times around the deck. Still steaming ahead scheduled to dock around 09:30 log says we have 23 nautical miles to our berth. Plan to go ashore today. 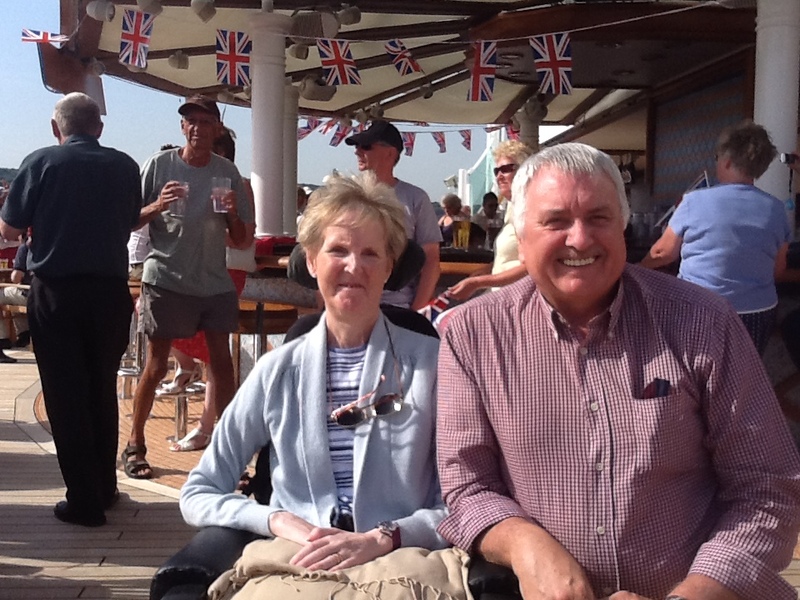 Bumpy ride for Margaret in wheelchair but made it to main square for a beer and soft drink in the warm sunshine. Is an island in the Adriatic sea with an area of 108 sq miles with 16182 inhabitants making it the second most populus after Krk. Our main stop. Venice is sited on a small group of 118 small islands. The construction on the marshy Venetian lagoon between the rivers PO and Piave. Whilst no official records exist of why Venice was built – historians have agreed that it was the site of refugees from other Italian cities which made up the early population. 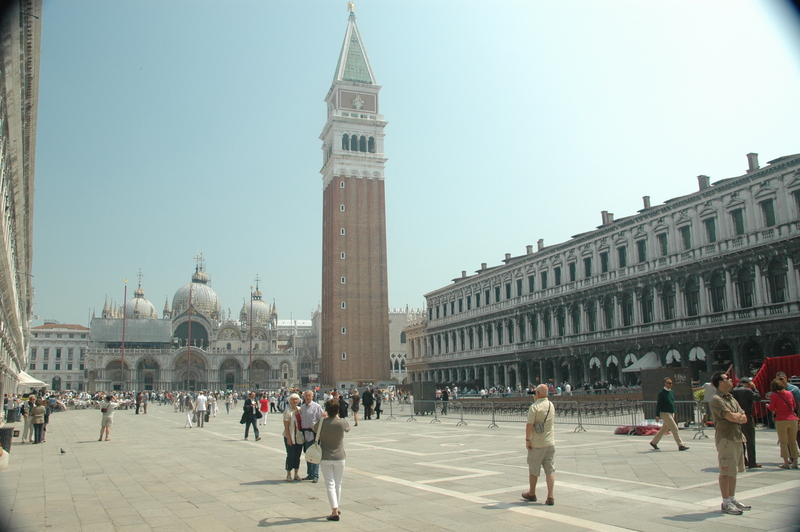 Venice is now a world heritage site with many fine architectural and art exhibits for tourists to admire. If you take a look at the map you will see the cruise terminal top left and to the left of the bridge linking the mainland. The main canal snaking its way through the centre of the image was the route that Ventura took in and out. Got up at 0630 to catch arrival into Venice, misty but sun was breaking through. Travelled into Venice by water bus joined the locals travelling to work and of course the many tourists. Good experience. Disembarked at San Marco, St Marks Square which was absolutely full of people heaven knows what a busy day would be like. 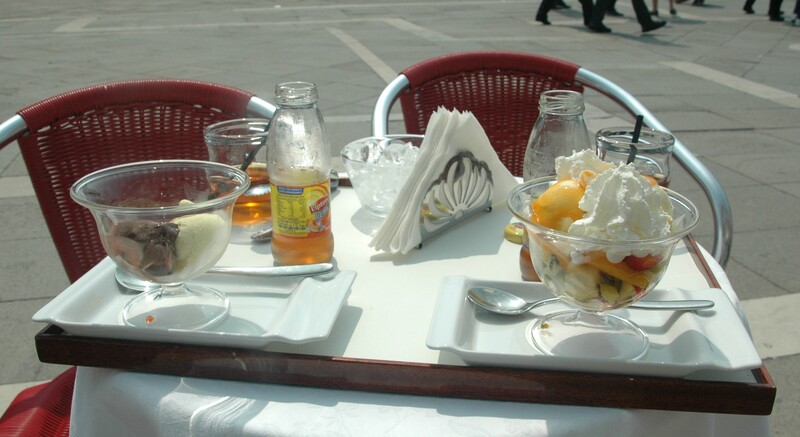 After looking around for a while we had our treat of Italian ice cream cost did not matter it was our treat. Slightly disappointing as there was no wheelchair suitable transport available so had a relaxing day on board, very warm still. Set sail for Messina @ 1600 due to arrive midday. Bamboo massage for me – likened it to being rolled with a rolling-pin for 75 mins. The masseur said I have tightened left shoulder and very tight calls and then they try to sell you all sorts of stuff at an astronomical price. Margaret catching up on her audio book. 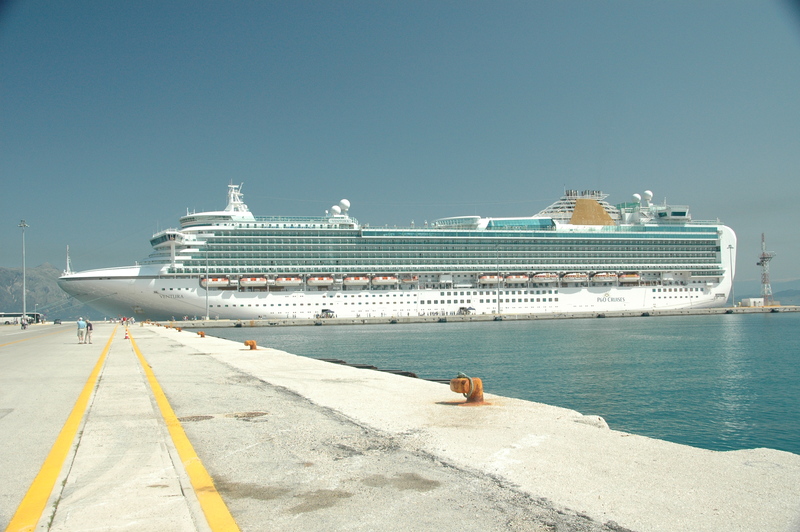 In no time at all it was lunch time and berthing taking place in Messina. Travelled down from Glasgow by air to Southampton on BE883 turbo pro. Coach arrived to take us to ship and embarkation procedures and finally on board ship just after noon. There were no rooms ready for the passengers so all congregated in one of deck 15 restaurants. Rooms ready just after 2-30 a dash as you can imagine with approx 2000 passengers making for lift not sure why as there is nowhere to go other than your room and back to eating etc. Room great plenty of space to keep the room shipshape. Lifeboat drill delayed to 16-30 as we are waiting for a number of passengers to arrive – there were delays on motorways and a train arriving late. All on board attend the drill in our muster station B for a debrief on procedures in the event of emergency. 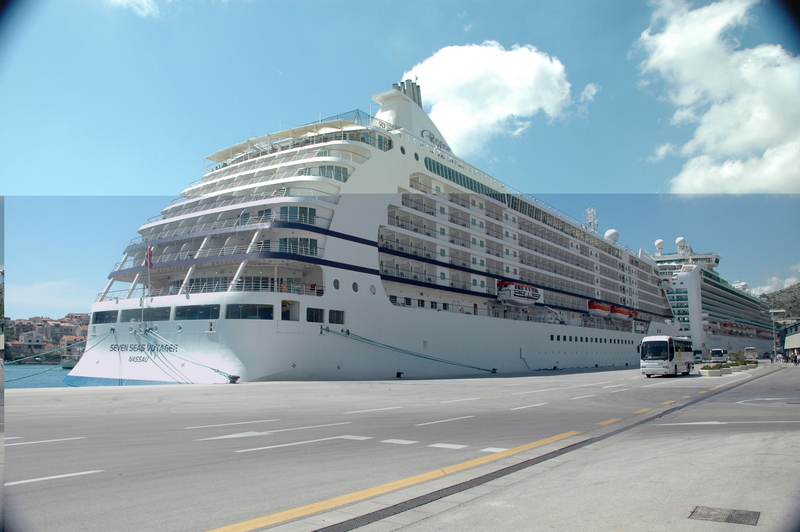 At 116,017 tonnes the Ventura has 15 passenger decks, 1,546 cabins and can accommodate 3,100 passengers. There are three pools: two on the pool deck and one at the stern, the center pool can also be covered by a glass-roofed skydome. 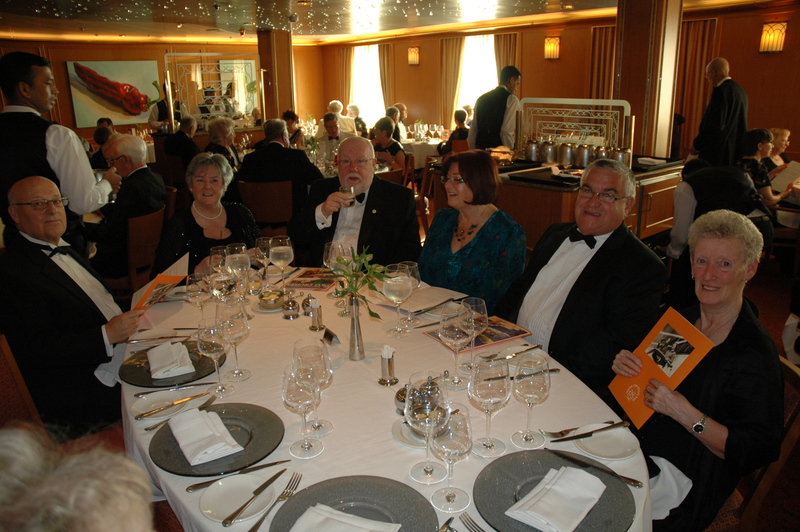 We were allocated a cabin on Deck 8 which was E deck amidships. Dinner in Saffron restaurant @ 18-30 table 95 for 10 persons. Our Ventura buddies were from Lanark, Manchester, Southport and Buckinghamshire. Departure delayed from Southampton by 4 hrs due to late arrivals – finally lines drawn at 2000 hrs. Up 0700 check out info screen on tele. We were Located just north of France, Brittany a distance of 214 nautical miles covered in 12 hrs at a speed of 21.4 knots. Quite a swell during the night just a little sway to rock you to sleep. Note from captains log scheduled to arrive in Malaga @ noon on 29 April and depart @ 1730 hrs. Lazy day at sea. Getting to know the ships 18 decks and lift locations. Woke around 6-30 in time to see North Africa as we went though the straits of Gibraltar. Arrive noon to a rather wet Malaga. 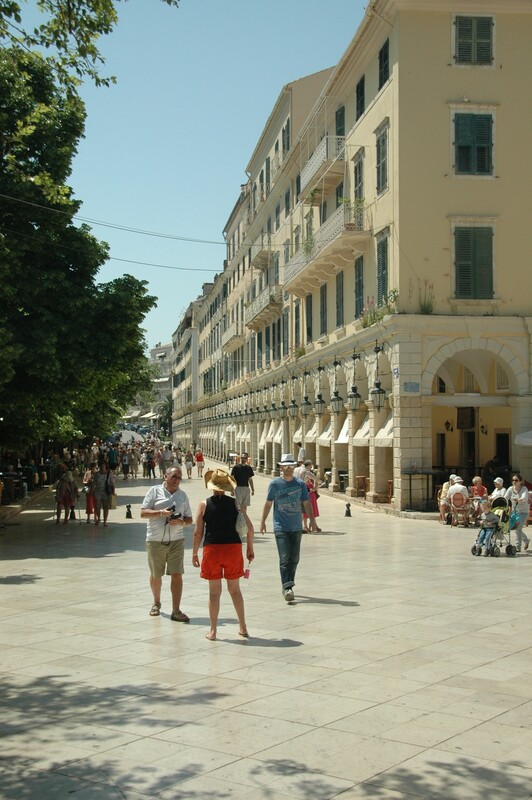 Rained most of the afternoon, cleared around 4pm till we set sail for Corfu @ 1730. Evening took in Roy Lewis Phil Collins tribute concert in Havana, it was OK. Many shows to go to over the course of the cruise in the main theatre. After yesterday’s poor weather we are enjoying a warm 16* with little wind. Decks well populated. Margaret sitting in shade listening to iPod touch after an Indian head Massage treatment. Awoke to sight of Algeria (Tines) on Starboard side, captains log informs that we are going east at 21.4 knots about 15 nautical miles from African coast. Scilly should be in view on port side tomorrow morning.